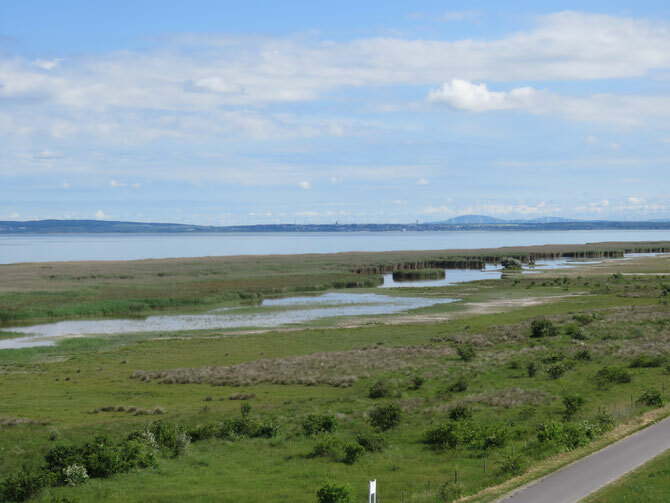 After I had left Bratislava, we were soon back at the border to Austria and on the jubilee bike path at the Neusiedlersee. 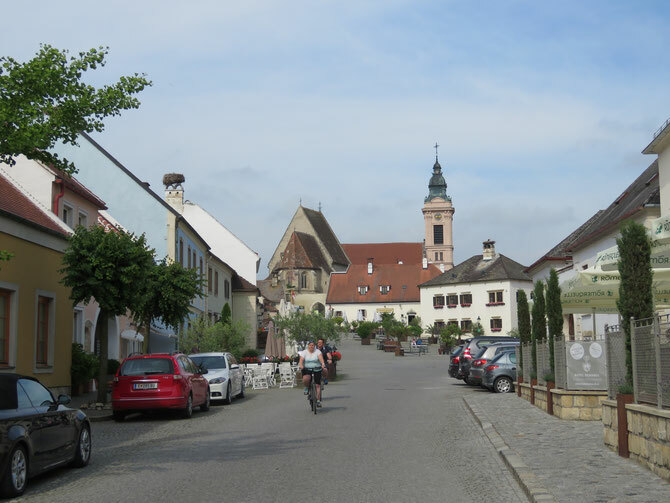 It was a mostly flat and undemanding ride over the expanse of the Burgenland. As I rode southwards I suddenly thought I discovered a very high perch. However, it turned out to be an observation tower for Great Bustards. I found myself in the middle of the territory of these majestic birds. 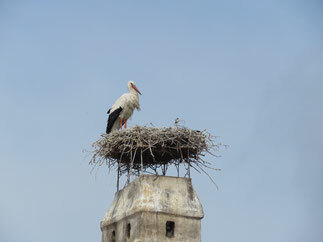 The tower was built up in the last few weeks and on the following day it was officially opened by "BirdLife" . How fortunate for me - only the bustards were missing. I started setting up my telescope and spoke with a father who showed the new tower to his two children. Suddenly I discovered four bustards and was able to show them to the father and his sons. Soon more people joined and also wanted to see these birds. We spoke about my project and where I will stay that night. 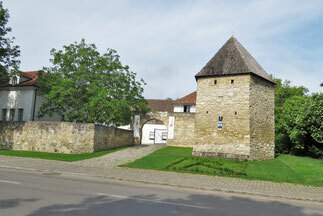 I said here underneath the tower where the grass was cut short, I would be able to get up early in the morning and allready be near the tower. 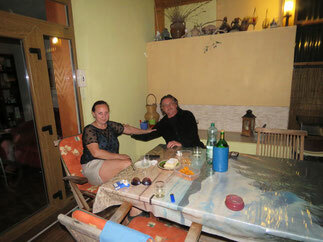 Adriana offered that I could probably spend the night with her and her husband Florin, but I would have to leave before eight o'clock in the morning, because they have to work in Vienna. I accepted the invitation with pleasure and we drove to her home. The neighboring family was already there for a party. 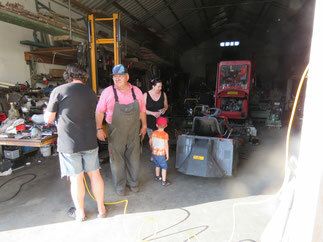 Because their neighbor was still working in his workshop, the party happened there. His wife had already cooked for a lot of people (it was a religious holiday) and so I joined a never-ending delicious meal. Thank you all. Pama would have been worth a detour as well even without bustards. 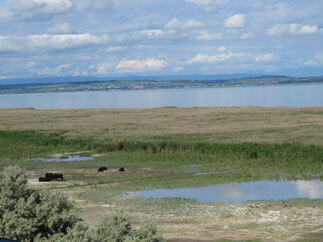 The next day, I again went to the tower and after enjoying some time of bird observation I cycled towards the lake. 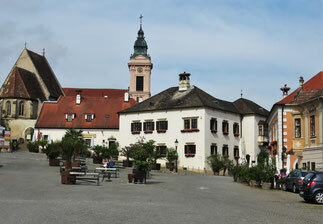 I rode along the north shore and spent the night on the camping ground in Breitengrund. This was a beautiful unaffected area. I especially noted this since I had just cycled a lot of areas with wind turbines. 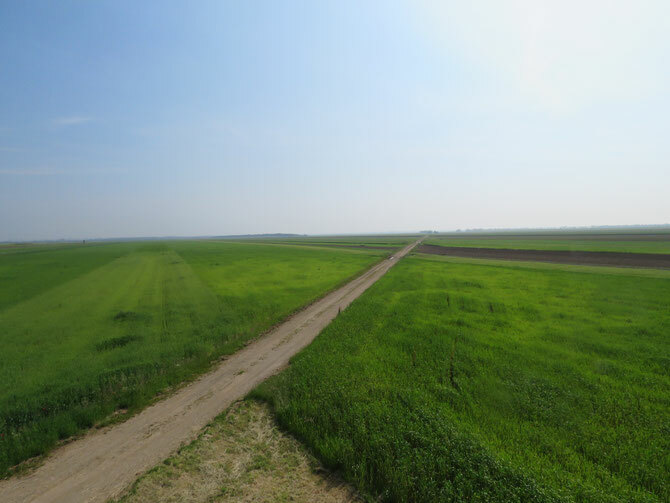 Here the reed belt is approximately 3 km wide. 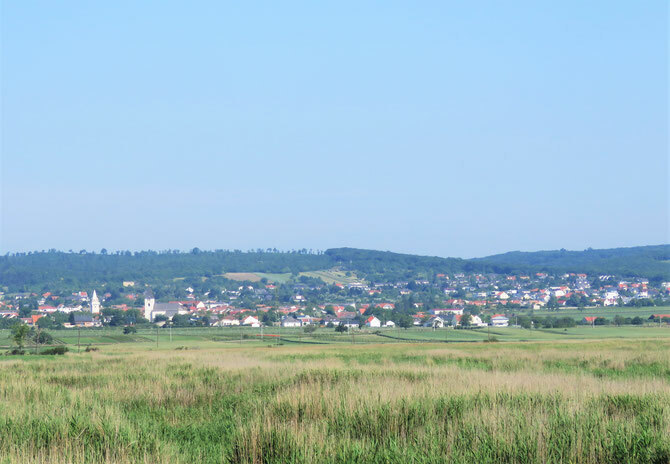 From the observation tower you can get a very rewarding view over the wide fields of reeds up to the hills with their picturesque villages and vineyards. Here I could take my time and really observe the birds around the reed belt. 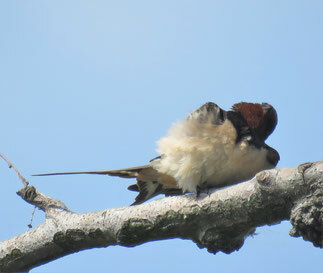 Soon I also discovered this little barn swallow, which sat oddly on a branch and enjoyed the sun. This is a real holiday destination - even for birds. 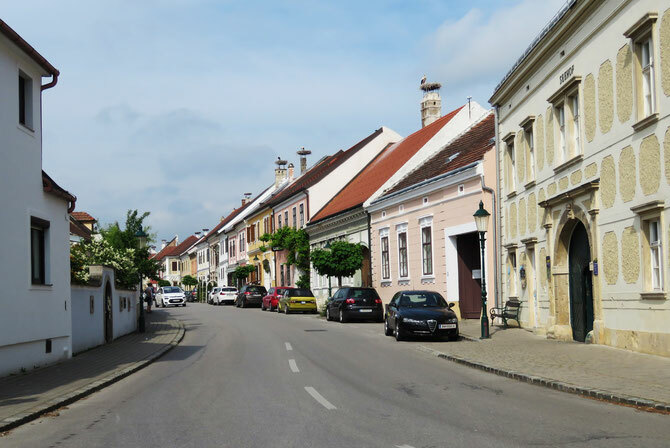 I enjoyed this landscape as well and so it took quite some time to make it through the pretty streets of the village to the famous town of Rust with its countless nests of white storkes. Further delay was caused by the many Heurigenfarms. Indeed riding a bike makes hungry and thirsty. Rust then was also the final destination because I missed the last ferry to Podersdorf. The next morning I crossed the lake with the ferry. 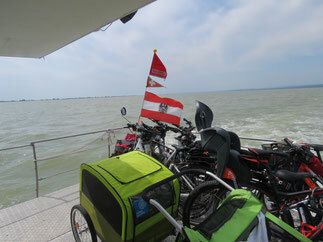 It took us two hours to cross the flat, brown and gray Neusiedlersee. The dispatcher asked me where I was going withe my heavy load and I told him that I would like to go to South Africa. Then the crossing is free for you, he said. Thank you very much. 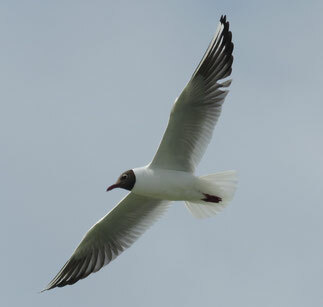 In Rust a family of greylag gees said goodbye and during the crossing we were accompanied by black-headed gulls. The arrival then at the lighthouse of Podersdorf was like the arrival of a big ferryboat in large sea port - just in bonsai format. 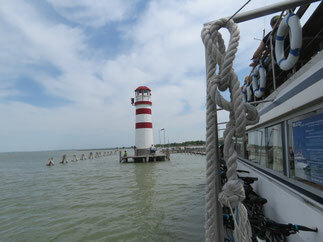 In Podersdorf I met with Astrid again and from here I also explored the Seewinkel and the Langen Lacken. 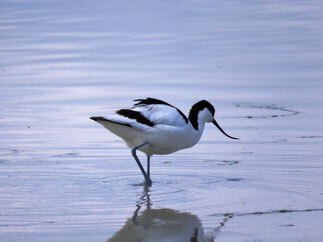 Both are very interesting ornithological areas. 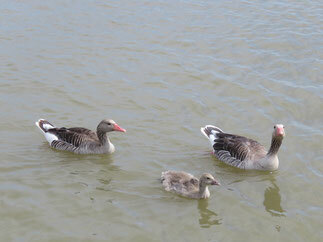 They are very important breeding areas for graylag geese and other wetlands birds in Europe. After three days I again made the road unsafe and wanted to make my way to Hungary. 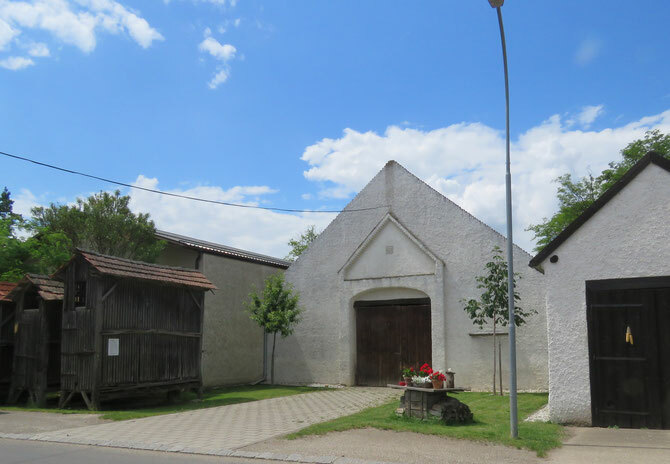 A quick visit to the church in Frauenkirch (this can never hurt) and then I cycled to Halbtturn, a farming village with typical drying containers for corn cobs in front of the farmhouses and then after only a few more kilometers I was at the Hungarian border.